BrightHaven > Blog > Animal Education > New booklet to help you help your animal! What is one of the most difficult things for any animal lover and pet parent to hear? It’s being told by the vet that your animal’s illness is terminal. What do I do now? How can I best support my animal friend? What is the best way forward for our family? These are just a few of the many challenging questions that such a diagnosis raises. 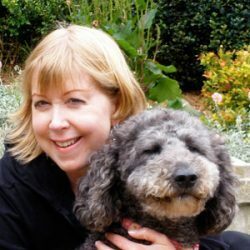 Follow Your Heart: Navigating a Terminal Diagnosis offers practical advice for the caregiver, both for at the vet’s office as well at home again with the family. With some guidelines from the BrightHaven perspective of living well each and every day, it compassionately addresses important considerations and options as the way forward is planned, and explores the possibility of hospice care and the natural dying process. The booklet does not support any specific methodology or belief, but simply shares some guidelines to help you make choices with awareness and with love. There’s no one right approach or answer—it depends on many factors unique to each situation. And if you purchase at https://smile.amazon.com/ and select BrightHaven as your favorite charitable organization, Amazon will donate a percentage of the sale price to BrightHaven! 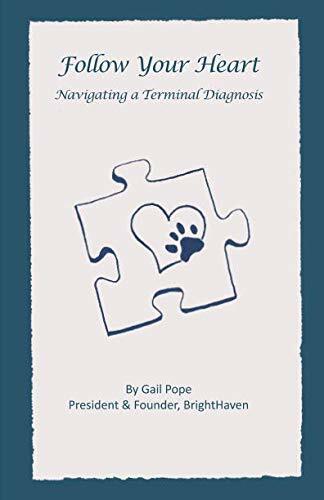 “The amazing depth, clarity and comprehensive detail that Gail Pope brings to her newest publication on “navigating” terminal illness in our animal companions makes this a must read for anyone who deeply loves animals. All questions answered, with a wealth of information on how to face and deal with this most difficult experience in a positive way that helps us humans as well.” ~Kate F.
All of us at BrightHaven sincerely hope that this booklet will be a source of comfort, knowledge and inspiration for you. 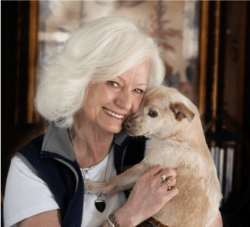 BrightHaven Resources to Help Your Animal Live Well Each and Every Day!